In the last few years, it seems DLC has gotten more common with Nintendo games. It’s been released for Mario Kart 8 and Super Smash Bros, complete with regular DLC packs every year or so. It’s happened with Zelda Breath of the Wild, complete with a full season pass being necessary to get the DLC packs. And with games like ARMS and Splatoon, it seems like free DLC is a core part of the experience. The games are released as minimum viable products first, then built on later. 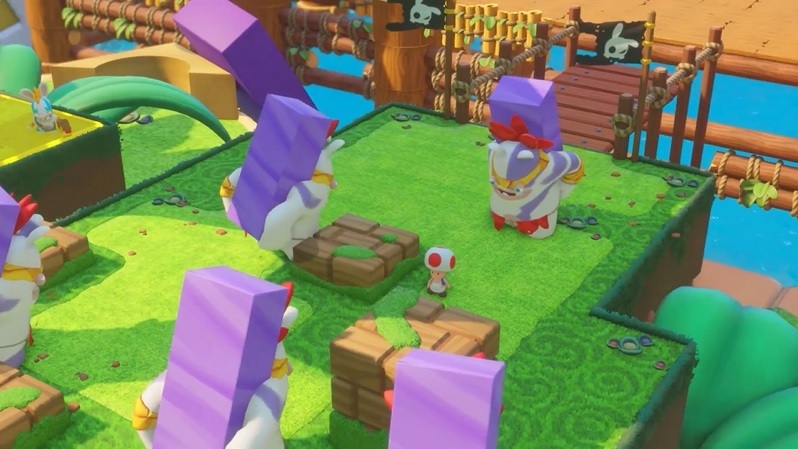 Which means it should surprise no one that Mario + Rabbids Kingdom Battle is getting its own DLC. Yep, as the title suggests, a new season pass has been announced for the title, with said pass allowing owners to get access to any DLC released for the game in future. It’s all fairly standard stuff for the most part. You’ve got a few extra steampunk weapons, as a reward for buying it early. You’ve got the new single player and co-op maps, like you’d expect from DLC setups like this. But then… you’ve got the interesting bit. Namely, the ‘new and unexpected story content’. And it’s this bit of the season pass which has us baffled. After all, won’t Mario + Rabbids Kingdom Battle be fairly self contained on the story front? I mean okay, we don’t really know how the ending works here. Yet from what we have seen of the storyline (like the intro), it seems like something that doesn’t leave much room for extras. Rabbids cause trouble, Mario and co fight back, they defeat them and take back the Mushroom Kingdom. You’d think that’d be something you could sum up in a few worlds and a final boss. But no, apparently Ubisoft has additional plans there. So we’re excited to see exactly where they take it. Where a game like this can even go with an extra DLC storyline or what not. Or why exactly the content is ‘new and unexpected’ in a game that’s already as ‘unexpected’ as can be. Still, all we can do is wait and see. So for now, we’ll just confirm that the pass costs $19.99 at retail, and will available when the games launches later this month. Let’s hope it turns out to be worth the price! 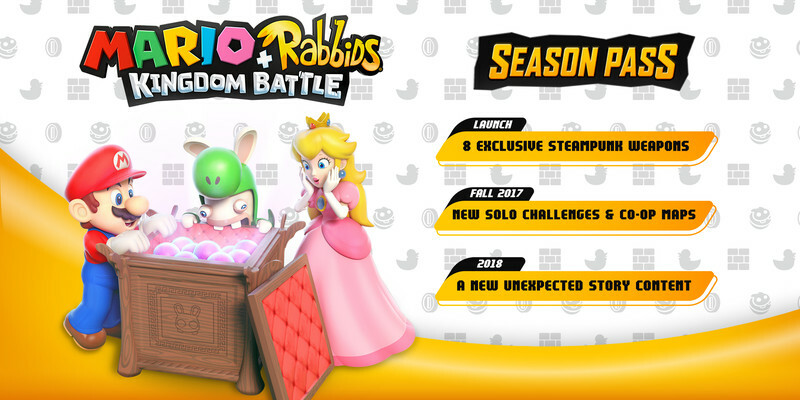 Mario + Rabbids Kingdom Battle: First DLC Pack Released!